The term oral cancer encompasses all malignancies that originate in the oral tissue. In the scientific literature, the phrase “oral cancer”is used to describe a multitude of combinations of tumors, benign and malignant, including, those of the lip, salivary glands, and pharynx, in addition to those of the oral cavity. Mouth and pharynx account for 363,000 new cases world-wide and almost 200,000 deaths. Squamous cell carcinoma (SCC) is the most common of all the neoplasm and comprises approximately 80% of cancers of oral cavity. Annually, there are approximately 500,000 new cases of head and neck cancer world-wide. Metastasis, the spread of a tumor cells from its primary lymph node (LN) to distant organs, is the most fearsome aspect of cancer. Patients presenting with metastatic disease or those developing metastases after successful management of primary tumor carry a universally grave prognosis. In fact, metastases is the cause of 90% of cancer deaths as stated by Hanahan et al., (2000). Tumor cell invade either the blood or the lymphatic vessels to access the general circulation and then establish in other (visceral) tissues. Hence, nodal status is a significant predictor for survival of patients with malignant tumors. 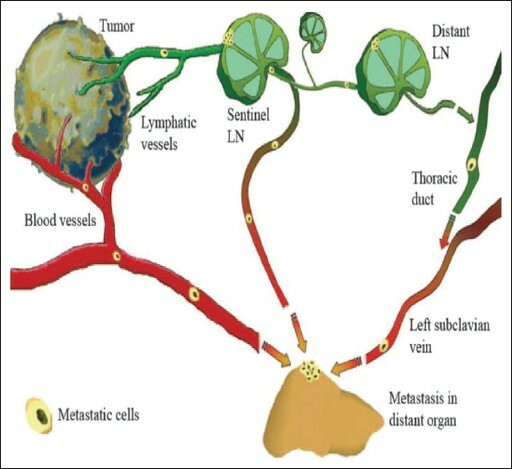 The concept of spread of tumor by the sentinel lymph nodes (SLNs) [Figure 1] and [Figure 2] is based on the premise that metastasis from the primary tumor follows an orderly progression and will first involve the most proximal draining (sentinel) LN before spreading to other LNs. Accordingly if the SLN is free of tumor, it is assumed that the remaining cervical LNs are free as well (cancer). Head and neck squamous cell carcinoma (HNSCC) also carries a high-rate of occult nodal metastasis (ONM). It is important to detect LN development in its early stage for improving the prognosis. The mechanisms by which malignant tumors, invade lymphatics, and metastasize to regional lymph nodes (RLNs) are complex and inter-related, the exact mechanisms have only recently been the subject of intense interest and sophisticated experimentation. Thus, metastasis to RLN is a complex process. It is often associated with several clinical and pathological characteristics. The involvement of RLN is often, a harbinger for increased risk of metastasis. New knowledge in this area can enable the clinicians and pathologists to study and treat tumors in a more directed fashion. A molecular approach to factors that predicts the likelihood of RLN metastasis could eliminate the reoccurrence of the tumor in the form of “micrometastasis” and “skip” metastasis. The aim of this review is to discuss different modes of spread of metastasis [Figure 1] and [Figure 2]. The involvement of carcinoma of the oral cavity has the propensity to metastasize to the cervical LNs even in the early stages. The presence of LN metastasis is the most significant independent variable in determining survival of patients with cancer of the head and neck[Table 1] [Figure 1] and [Figure 2]. LNs are small, oval or reniform bodies, 0.1-2.5 cm long, lying in the course of the lymphatic vessels. A LN  is essentially a continuous framework consisting of the capsule, trabeculae and the reticulum, with cells enmeshed in it. Reticulum: This network of fine reticulin fibers and associated cells permeates the spaces enclosed in the capsule and trabeculae and supports the cell masses within them. Zone III: Comprises the germinal centers (GCs) of follicles, which are particularly prominent in antigenically stimulated LNs; its cells include large lymphoblasts, some in mitosis, dendritic cells and macrophages. These zones may form a maturation sequence, lymphocytes arising by the division in GCs (zone III), passing to the dense zone II, becoming smaller and finally migrating to zone I, from which they may transverse the endothelium into the sinuses. The distribution of B and T lymphocytes within the nodes can be mapped by their immunohistological reaction to monoclonal antibodies. In order to establish a consistent and easily reproducible, user friendly method for description of RLNs, which establishes a common language between the clinician and the pathologist, the Head and Neck Service at Memorial Sloan Kettering Cancer Center has described a leveling system of cervical LNs. This system divides the LNs in the lateral aspect of the neck into five nodal groups or levels. 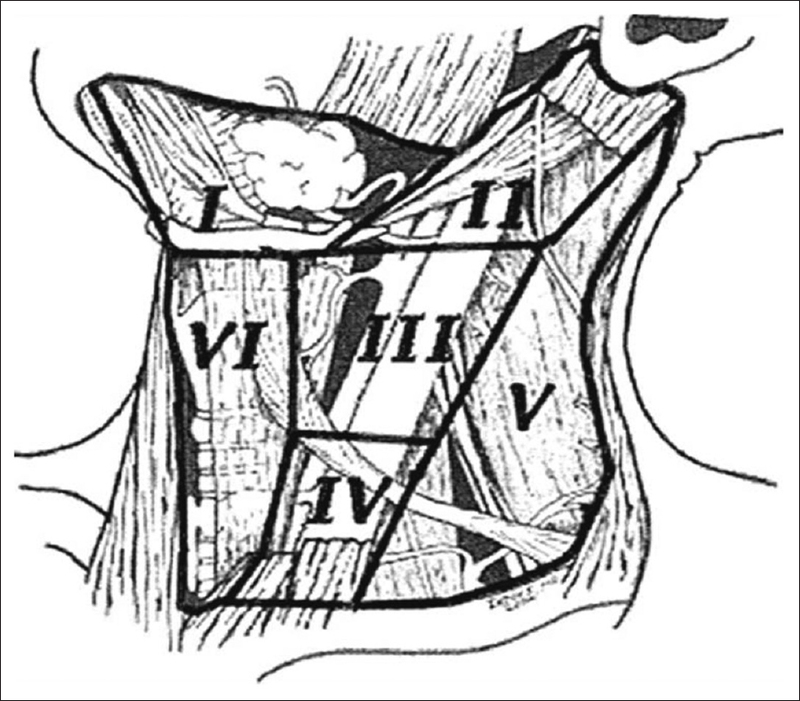 In addition, LNs in the central compartment of the neck are assigned levels VI and VII (The central compartment of the neck includes the delphian LN overlying the thyroid cartilage in the midline draining the larynx and parathyroid LNs adjacent to the thyroid gland) [Figure 4]. Level VII: Superior mediastinal group. The presence of occult LN metastasis is considered as one of the most important prognostic factor, which leads to a reduction in the probability of disease control and shortens the survival of patients. The incidence of occult metastasis in neck LNs in patients with oral malignant tumors ranges from 23.7% to 42%, but the rate is found to be higher in tongue and floor of the mouth tumors. It was also found that out of the demographic, clinical and pathological factors analyzed, with the exception of muscular invasion, none were predictive of occult metastasis in neck LNs., On the other hand, thickness was a direct measurement by the pathologist of the vertical bulk of tumor regardless of the histologic structure of the ulcerative or exophytic form of tumor growth. Al-Rajhi et al., demonstrated that the risk of occult LN disease is minimal in cases of tumor thickness <10 mm and in these cases the author did not recommended any elective neck dissection (END). Woolgar  did not find neck metastasis in tumors <5 mm thickness. Kurokawa et al.,, described that depth ≥4 mm was a predictive factor for LN metastasis. Rasgon et al., found high rates of neck metastasis in tumors thicker than 5 mm, although they did not define what methodology was used for making this measurement. Between the routine use of END in all N0 neck and a “wait and see” policy, sentinel node biopsy (SNB) in HNSCC has been suggested as a method to improve the accuracy of staging and tailor treatments. 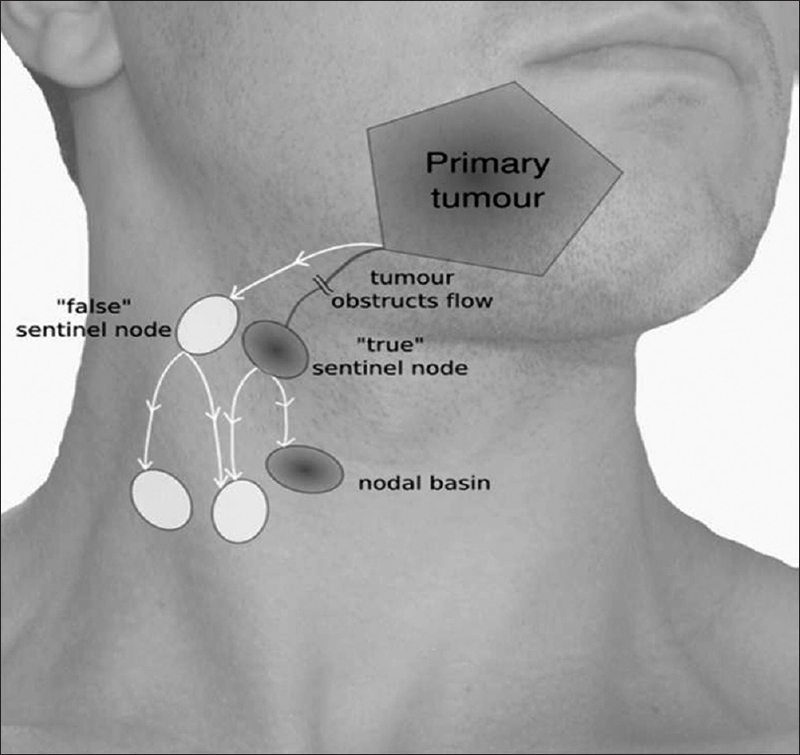 Although, in melanoma and breast cancer the SN procedure is widely employed, for SCC of the head and neck the most active proponents state that it is “safe and accurate with … the potential to become the new standard of care.” The SLN is defined as the first node in the lymphatic basin into which the primary tumor drains. The primary afferent lymphatic first drains into the SLN of the respective basin. Therefore, the status of the SLN(s) accurately reflects the entire basin. If the SLN is not involved with metastatic disease, the remainder of the LNs should also be negative. Likewise, if the SLN is positive, the risk exists that higher order nodes may also be involved with metastatic disease. The validity of the concept is based on the fact that if the sentinel node is free of metastasis, then other more distal nodes are also disease free. Following the first application of SNB in epidermoid carcinoma of the head and neck, Pitman using vital dyes on 16 patients did not identify any sentinel node. Koch reported 60% success in identification of the sentinel node using lymphoscintigraphy and intra-operative probes. Shoaib carried out the sentinel node procedure with lymphoscintigraphy, intra-operative probes and vital dye, obtaining a high sensitivity. Other authors established results in head and neck cancer, although in series of small samples; it being Shoaib who presented results with a high sensitivity in a sample of 40 cases of head and neck cancer. Kowalski in a review of 513 patients found that in high-risk patients the possibility of presenting contralateral metastasis is greater than 20%. Byersin a review of lingual tumors at stage T1 to T2 found 16% of cases with an unpredictable or disordered drainage and were defined as “skip metastases” and which we have named jump metastases. Other authors such as Woolgar found a 10% incidence in 154 patients. SNB should be considered a highly sensitive diagnostic procedure, thus it is a valid alternative to elective stage dissection. It reduces both time spent in surgery and postoperative morbidity. The technique should be carried out using lymphoscintigraphy, vital dye and an intra-operative gamma probe. SNB is technically feasible, and after the initial acquisition of experience by a multidisciplinary team can be safely used. Nevertheless, the role of SNB in HNSCC is still undecided. Surgeons should be aware that these patients have a N0 neck and good prognosis, and that elective Sentinel node dissection (SND) has proven reliability and world-wide acceptance. The SN concept defines the surgical approach to a N0 neck, tailoring the dissection on the lymphatic drainage pattern to the specific patient. Discontinuous metastases defined as the metastatic spread of a cancer cells in which contiguous regions are skipped, while distant foci of the cancer cells are present, a finding with a poor prognosis. A topic of ongoing debate in the recent literature concerns the concept of skip metastasis, in particular when the primary site of the tumor is the oral cavity and especially the tongue. There are normal anatomical lymphatic channels that bypass or skip an orderly progression of nodal metastasis. Although, clinical observation suggested that the metastatic involvement of the various LN regions usually progresses from superior to inferior in the neck, LN groups may bypass even on normal lymphography. The possibility of tumor cells escaping the usual draining LNs and metastasizing to other LNs (skip metastasis) has been well documented in subsets of patients with head and neck and non-head and neck cancers. This phenomenon of skip metastases in cancer of the tongue and the mouth is supported by the anatomic findings described by Rouvière., Metastasis to inferior cervical nodes at levels III or IV in the absence of demonstrable involvement of levels I and II have been reported in cancers of the oral cavity. In 1997, Byers et al., published an interesting paper reporting 277 previously untreated patients with SCC of the oral tongue. Of all patients, 15.8% had either level IV metastasis as the only manifestation in the neck or level III nodes were the only metastatic LNs without disease in levels I and II. In 1997, Woolgar  also reported a 10% incidence of skip metastasis at levels II and III in a series of neck dissections from 154 previously untreated patients with SCC of the oral mucosa. “Peppering” of nodes at multiple levels without any macroscopic focus was seen in 5% of cases. Hence, “fast-tracts” or long-range pathways accounted for the distribution of metastatic carcinoma in 15% of positive necks.,, Therefore, an orderly progressive (”over or”) involvement of anatomic levels was seen in 85% of positive necks. Skipping of anatomical levels and “peppering” were seen only in association with tongue tumors, apart from the single case of a tumor of the anterior midline of the mouth. In 1999, Woolgar concluded that neck dissection should include level IV when the primary tumor involves the tongue, considering the “erratic” (unpredictable) pattern of metastasis of this cancer. Kerawala and Martin (1998) reported two patients with cancer of the floor of the mouth with the presence of skip metastasis. In 2000, Hamakawa et al., reported a skip metastasis in a patient with tongue cancer. Carter et al., found that macroscopic extra-capsular spread was seen most frequently in association with large nodal masses >3 cm in diameter, but also occurred in some specimens with smaller LNs <3 cm in diameter. Macroscopic extra-capsular infiltration was associated with a high incidence of recurrent tumor in the ipsilateral neck, particularly within 12 months of surgery. Microscopic extra-capsular growth was associated with a lower incidence of recurrent tumor in the ipsilateral neck but the difference did not reach statistical significance (Myers and Alvi). Myers et al., retrospectively studied 266 patients with SCC of the oral tongue treated with surgical resection of the primary tumor and neck dissection, and found that extra-capsular spread was the most significant predictor of both regional recurrence and development of distant metastasis resulting in a decreased survival. Further evaluation of this cohort of patients by Greenberg et al., that the number of LNs involved with extra-capsular spread was a highly significant predictor of disease-specific and overall survival. Extra-capsular spread is encountered even in patients with clinically N0 disease, as demonstrated in a study consisting of 109 patients undergoing END for clinically N0 disease (Alvi and Johnson, 1996). Of the patients, 34% had occult metastases and in half of them, extra-capsular spread was detected. Also in that study, extra-capsular spread was a strong indicator of recurrent disease and poor prognosis. In addition, the number of metastatic LNs (Leemans et al., 1993) and anatomical level of node involvement (Kowalski et al., 2000) have been reported to predict outcome of patients with HNSCC; the risk being higher for patients with multiple metastatic nodes, involved nodes at levels IV and V, and/or contralateral or bilateral metastatic nodes. The structural organization and function of normal tissue is to a great extent determined by interactions between cells and the extracellular matrix (ECM). 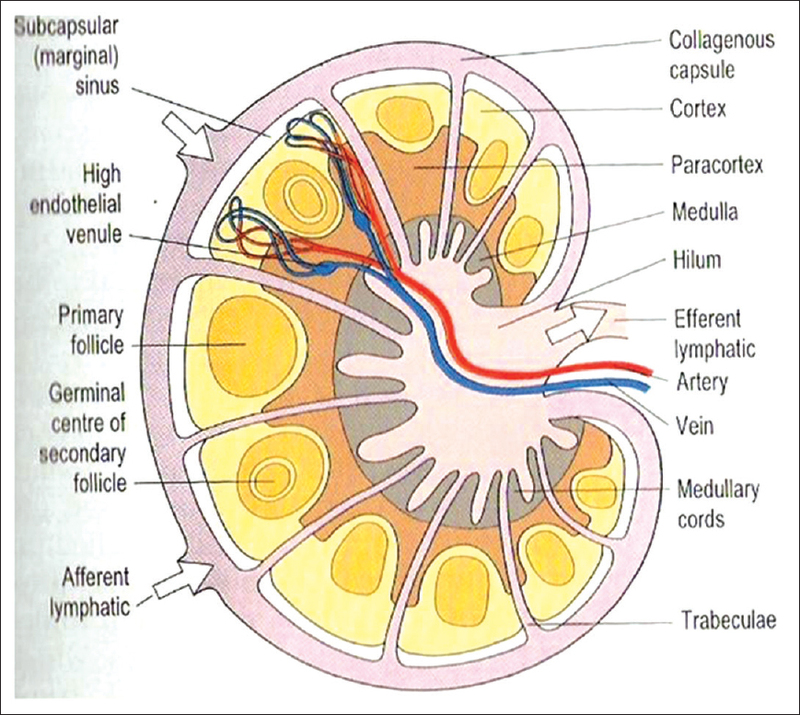 Tissues are organized into compartments separated from each other by two types of ECM: That is basement membrane and interstitial connective tissue. Although organized differently, each of these components of ECM is made up of collagens, glycoproteins, and proteoglycans. Tumor cells must interact with the ECM at several stages in the metastatic cascade. A carcinoma must first breach the underlying basement membrane, then transverse the interstitial connective tissue and ultimately gain access to the circulation by penetrating the vascular basement membrane ,, [Figure 5] and [Figure 6]. Many lymphatic and lymphatico-venous shunts bypass RLNs and these shunts allow both lymphatic and hematogenous dissemination of malignant cells. Chemokine mediated mechanisms lead to tumor cell invasion into LN. RLNs is considered to have their primary function merely not in anatomical barriers to the systemic dissemination of tumor cells but also in immunological surveillance. A large majority of lymphocytes in the LNs are static. When the LN elicits the immune response, the node enlarges in size (reactive hyperplasia). The immune response can be assessed histologically. The morphological changes indicate a cell-mediated immune response (CMR) which results in paracortical hyperplasia and sinus histiocytosis. The morphological changes indicating a humoral immune response is the follicular hyperplasia (GC formation).,, of the two mechanisms the suppression of CMR, in particular T-cell, is correlated to LN metastasis. 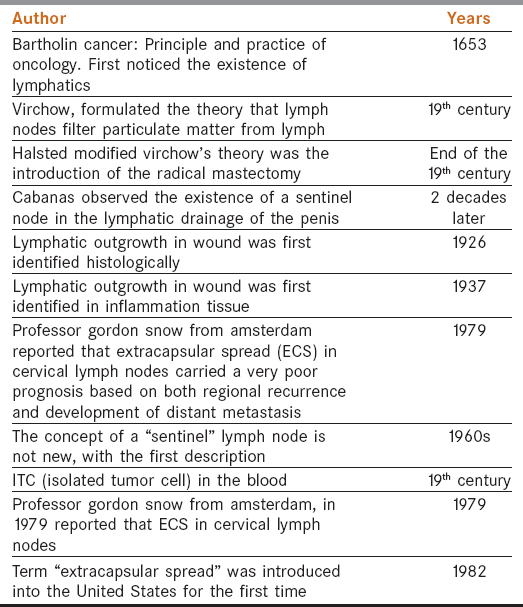 A variety of studied (as done by [Catlin et al.,]) have also indicated that the biological behavior of the cancer represented by the temporal sequence of the cancer growth in the RLNs was more important by far than the anatomic fact of the presence of the LN metastases. The timing of the LN metastases was considered as key to understanding the biological aggressiveness. 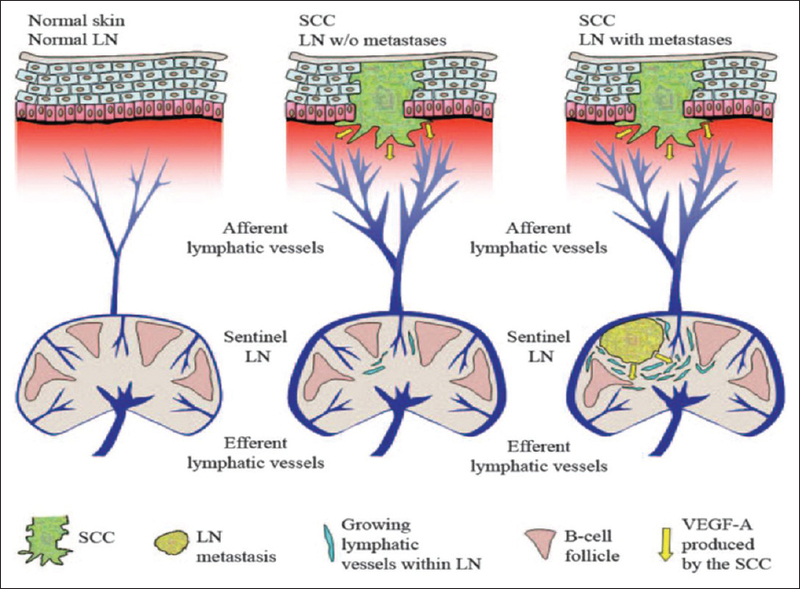 It is apparent from a number of studies that cancer cells disseminate relatively early in both lymphatic and blood vessels in a large proportion of cancers, and can be detected cytologically, yet their presence is not necessarily correlated with a poor outcome.,,,,, The experimental work of Folkmann indicates that local angiogenesis is necessary to overcome the limitations of diffusion as a sole nutrient source of metaststic cells before progressive growth of disseminated cancer cells occur and produce clinical metastases. 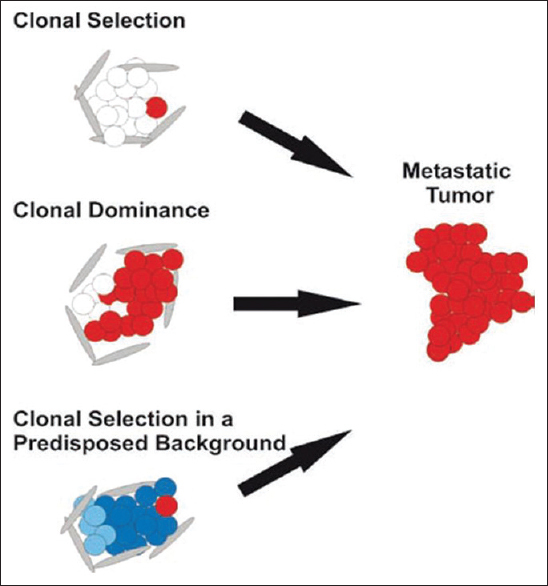 Work by Fidler, demonstrated another aspect of the biology of the metastatic process. He has emphasized on the “biologic homing of the metaststic cells. In all, the lymphatic vasculature, the process of neoangiogenesis, the VEGFs (vascular endothelial growth factors) role in combination represents the most important pathway for tumor cell dissemination, and tumor cell metastasis ,,,,,,,,,,,, [Figure 8]. Thus, to conclude the biology of the cancer is paramount. The role of LN (lymph node) metastasis is passive, not active, and helps identify the biology of tumor-host interaction. No clear evidence in any clinical study, either prospective or retrospective, indicates that such regional nodal metastasis are controlling or governing factors in prognosis. Weiss emphasized this absence of control of prognosis by LN metastasis strongly, and concluded,” local therapy aimed at LN themselves will no more effectively control (distant) metastasis than removal of the speedometer from a car will reduce its speed. Prabhu SR, Johnson NW, Daftary DK, Wilson DF. Oral Diseases in the Tropics, 1st ed. USA: Oxford University Press; 1992. Allison P, Locker D, Feine JS. The role of diagnostic delays in the prognosis of oral cancer: A review of the literature. Oral Oncol 1998;34:161-70. Okura M, Kagamiuchi H, Tominaga G, Iida S, Fukuda Y, Kogo M. Morphological changes of regional lymph node in squamous cell carcinoma of the oral cavity. J Oral Pathol Med 2005;34:214-9. Califano J, van der Riet P, Westra W, Nawroz H, Clayman G, Piantadosi S, et al. Genetic progression model for head and neck cancer: Implications for field cancerization. Cancer Res 1996;56:2488-92. Khanna C, Hunter K. Modeling metastasis in vivo. Carcinogenesis 2005;26:513-23. Bogenrieder T, Herlyn M. Axis of evil: Molecular mechanisms of cancer metastasis. Oncogene 2003;22:6524-36. Meyers EN, Suen JY, Meyers JN, Hanira YN. 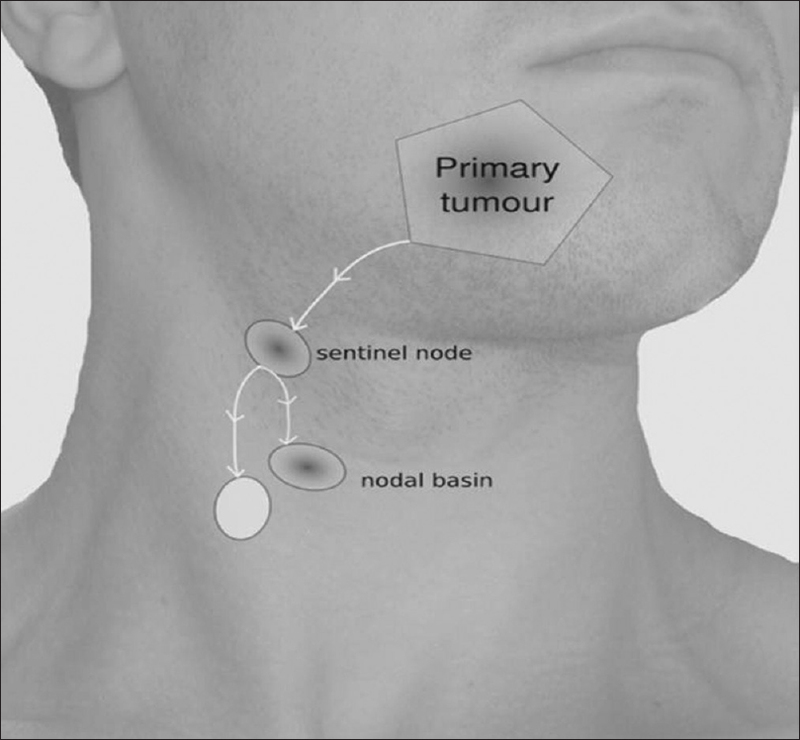 Sentinel lymph node biopsy for head and neck cancer. Cancer of Head and Neck, 4th ed. India: Saunders-An imprint of Elsevier; 2003. p. 34-5. Barrera JE, Miller ME, Said S, Jafek BW, Campana JP, Shroyer KR. Detection of occult cervical micrometastases in patients with head and neck squamous cell cancer. Laryngoscope 2003;113:892-6. Nathanson SD Insights into the mechanisms of lymph node metastasis. Cancer 2003;98:413-23. Hellman, Devita VT, Rosenberg SA. Carcinogenesis Cancer: Principle and Practice of Oncology, 8th ed. USA: Wolters Kluwer/Lippincott Williams and Wilkin; 2008. p. 117-46. Meyers J. sentinel lymph node biopsy in oral cancer. Oral Cancer Metastasis, 1st ed. New York: Springer; 2010. p. 1-105. Tanis PJ, Nieweg OE, Valdés Olmos RA, Th Rutgers EJ, Kroon BB. History of sentinel node and validation of the technique. Breast Cancer Res 2001;3:109-12. Hermanek P, Hutter RV, Sobin LH, Wittekind C. International Union Against Cancer. 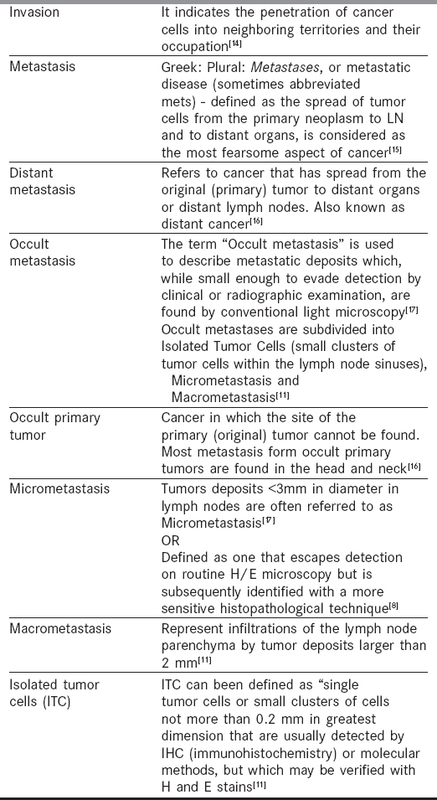 Classification of isolated tumor cells and micrometastasis. Cancer 1999;86:2668-73. Neoplasia. Robbins and Cartan: Pathologic basis of diseases, 7th ed. New Delhi: Thomson Press; 2006. p. 338. Mareel M, Leroy A. Clinical, cellular, and molecular aspects of cancer invasion. Physiol Rev 2003;83:337-76. National Cancer Institute. Dictionary of Cancer Terms, 2nd ed. New York: Elsevier; 2004. p. 232-8. Ferlito A, Partridge M, Brennan J, Hamakawa H. Lymph node micrometastases in head and neck cancer: A review. Acta Otolaryngol 2001;121:660-5. Grays H. The Anatomical Basis of Clinical Practice, 40th ed. Spain: Elsevier; 2005. p. 75-6. Shah JP, Patel SG, Singh B. Chapter 11=Cervical Lymph Nodes. Head and Neck Surgery and Oncology, 3rd ed. Philadelphia: China Mosby-An Imprint of Elsevier; 2003. p. 353-5. Shingaki S, Takada M, Sasai K, Bibi R, Kobayashi T, Nomura T, et al. Impact of lymph node metastasis on the pattern of failure and survival in oral carcinomas. Am J Surg 2003;185:278-84. Rekhi B, Gorad BD, Kakade AC, Chinoy R. Scope of FNAC in the diagnosis of soft tissue tumors: A study from a tertiary cancer referral center in India. Cytojournal 2007;4:20. Antonio JK, Santini S, Politi D, Sulfaro S, Spaziante R, Alberti A, et al. Sentinel lymph node biopsy in squamous cell carcinoma of the head and neck: 10 years of experience. Acta Otorhinolaryngol Ital 2012;32:18-25. Attia AA, Omar W. The value of sentinel lymph node localization and biopsy in squamous cell carcinoma of the oral cavity. J Egyptian Nat Cancer Inst 2002;14:177-83. Alvarez Amézaga J, Barbier Herrero L, Pijoan del Barrio JI, Martín Rodríguez JC, Romo Simón L, Genolla Subirats J, et al. Diagnostic efficacy of sentinel node biopsy in oral squamous cell carcinoma. Cohort study and meta-analysis. Med Oral Patol Oral Cir Bucal 2007;12:E235-43. Rouvière H, Tobias MJ. Lymphatic system of the head and neck, 1st ed. Anatomy of the Human Lymphatic System. Ann Arbor, MI: Edwards Brothers; 1938. p. 5-28. Ferlito A, Shaha AR, Rinaldo A, Pellitteri PK, Mondin V, Byers RM. Skip metastases from head and neck cancers. Acta Otolaryngol 2002;122:788-91. Byers RM, Weber RS, Andrews T, McGill D, Kare R, Wolf P. Frequency and therapeutic implications of skip metastases in the neck from squamous carcinoma of the oral tongue. Head Neck 1997;19:14-9. Woolgar JA. Detailed topography of cervical lymph-note metastases from oral squamous cell carcinoma. Int J Oral Maxillofac Surg 1997;26:3-9. Regauer S, Mannweiler S, Anderhuber W, Gotschuli A, Berghold A, Schachenreiter J, et al. Cystic lymph node metastases of squamous cell carcinoma of Waldeyer's ring origin. Br J Cancer 1999;79:1437-42. Ferlito A, Rinaldo A, Devaney KO, MacLennan K, Myers JN, Petruzzelli GJ, et al. Prognostic significance of microscopic and macroscopic extracapsular spread from metastatic tumor in the cervical lymph nodes. Oral Oncol 2002;38:747-51. Schipper JH, Frixen UH, Behrens J, Unger A, Jahnke K, Birchmeier W. E-cadherin expression in squamous cell carcinomas of head and neck: Inverse correlation with tumor dedifferentiation and lymph node metastasis. Cancer Res 1991;51:6328-37. Yonemoto M, Yusa H, Yamagata K, Fujita S, Yamaguchi A, Yoshida H. Squamous cell carcinoma of the base of the tongue with initial presentation of cystic metastasis in contralateral cervical lymph node. Oral Oncol 2006;42:56-9. Morton DL, Wen DR, Wong JH, Economou JS, Cagle LA, Storm FK, et al. Technical details of intraoperative lymphatic mapping for early stage melanoma. Arch Surg 1992;127:392-9. Som PM. Detection of metastasis in cervical lymph nodes: CT and MR criteria and differential diagnosis. AJR Am J Roentgenol 1992;158:961-9. Wang X, Heller R, VanVoorhis N, Cruse CW, Glass F, Fenske N, et al. Detection of submicroscopic lymph node metastases with polymerase chain reaction in patients with malignant melanoma. Ann Surg 1994;220:768-74. Brizel DM, Scully SP, Harrelson JM, Layfield LJ, Bean JM, Prosnitz LR, et al. Tumor oxygenation predicts for the likelihood of distant metastases in human soft tissue sarcoma. Cancer Res 1996;56:941-3. Shintani S, Matsuura H, Hasegawa Y, Nakayama B, Fujimoto Y. The relationship of shape of tumor invasion to depth of invasion and cervical lymph node metastasis in squamous cell carcinoma of the tongue. Oncology 1997;54:463-7. Kim K, Park SJ, Kim BT, Lee KS, Shim YM. Evaluation of lymph node metastases in squamous cell carcinoma of the esophagus with positron emission tomography. Ann Thorac Surg 2001;71:290-4. Montes DM, Carlson ER, Fernandes R, Ghali GE, Lubek J, Ord R, et al. Oral maxillary squamous carcinoma: An indication for neck dissection in the clinically negative neck. Head Neck 2011;33:1581-5. Lin CS, Jen YM, Cheng MF, Lin YS, Su WF, Hwang JM, et al. Squamous cell carcinoma of the buccal mucosa: An aggressive cancer requiring multimodality treatment. Head Neck 2006;28:150-7. Shih CH, Ozawa S, Ando N, Ueda M, Kitajima M. Vascular endothelial growth factor expression predicts outcome and lymph node metastasis in squamous cell carcinoma of the esophagus. Clin Cancer Res 2000;6:1161-8. Taback B, Hashimoto K, Kuo CT, Chan A, Giuliano AE, Hoon DS. Molecular lymphatic mapping of the sentinel lymph node. Am J Pathol 2002;161:1153-61. Costa C, Soares R, Reis-Filho JS, Leitão D, Amendoeira I, Schmitt FC. Cyclo-oxygenase 2 expression is associated with angiogenesis and lymph node metastasis in human breast cancer. J Clin Pathol 2002;55:429-34. Pitman KT, Ferlito A, Devaney KO, Shaha AR, Rinaldo A. Sentinel lymph node biopsy in head and neck cancer. Oral Oncol 2003;39:343-9. Li Q, Yi X, Yinghua C. Strategy against micrometastasis of epithelial cancer: Detection and elimination. Chin Sci Bull2002;47:1415-21. 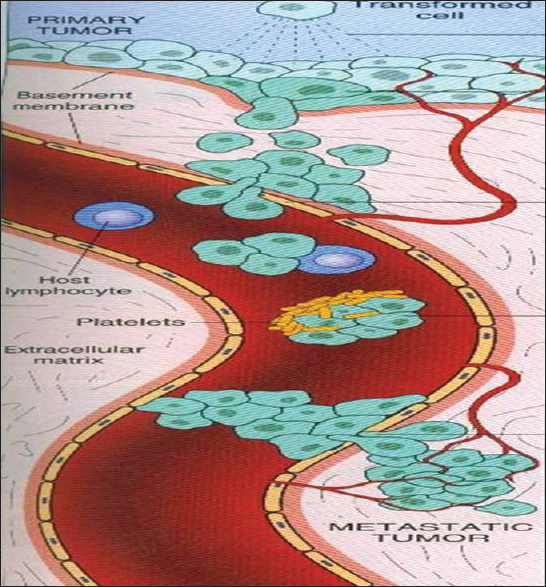 Tobler NE, Detmar M. Tumor and lymph node lymphangiogenesis: Impact on cancer metastasis. J Leukoc Biol 2006;80:691-6. Kishimoto K, Sasaki A, Yoshihama Y, Mese H, Tsukamoto G, Matsumura T. Expression of vascular endothelial growth factor-C predicts regional lymph node metastasis in early oral squamous cell carcinoma. Oral Oncol 2003;39:391-6. Kurita H, Koike T, Narikawa JN, Sakai H, Nakatsuka A, Uehara S, et al. Clinical predictors for contralateral neck lymph node metastasis from unilateral squamous cell carcinoma in the oral cavity. Oral Oncol 2004;40:898-903. Sakakura K, Chikamatsu K, Sakurai T, Takahashi K, Murata T, Oriuchi N, et al. Infiltration of dendritic cells and NK cells into the sentinel lymph node in oral cavity cancer. Oral Oncol 2005;41:89-96. Nagata T, Schmelzeisen R, Mattern D, Schwarzer G, Ohishi M. Application of fuzzy inference to European patients to predict cervical lymph node metastasis in carcinoma of the tongue. Int J Oral Maxillofac Surg 2005;34:138-42. Gallegos-Hernández JF, Hernández-Hernández DM, Flores-Díaz R, Sierra-Santiesteban I, Pichardo-Romero P, Arias-Ceballos H, et al. The number of sentinel nodes identified as prognostic factor in oral epidermoid cancer. Oral Oncol 2005;41:947-52. Goto M, Hasegawa Y, Terada A, Hyodo I, Hanai N, Ijichi K, et al. Prognostic significance of late cervical metastasis and distant failure in patients with stage I and II oral tongue cancers. Oral Oncol 2005;41:62-9. Nagatsuka H, Hibi K, Gunduz M, Tsujigiwa H, Tamamura R, Sugahara T, et al. Various immunostaining patterns of CD31, CD34 and endoglin and their relationship with lymph node metastasis in oral squamous cell carcinomas. J Oral Pathol Med 2005;34:70-6. Garrel R, Makeieff M, Alovisetti C, Costes V, Comte F, Crampette L, et al. Sentinel lymph nodes in oropharyngeal and oral carcinomas. Fr-ORL 2005;88:108-15. Kowalski LP, Carvalho AL, Martins Priante AV, Magrin J. Predictive factors for distant metastasis from oral and oropharyngeal squamous cell carcinoma. Oral Oncol 2005;41:534-41. Mallet Y, Lallemant B, Robin YM, Lefebvre JL. Cystic lymph node metastases of head and neck squamous cell carcinoma: Pitfalls and controversies. Oral Oncol 2005;41:429-34. Brennan PA, Hoffman GR, Mackenzie N, Ethunandan M, Boote DJ, Mellor TK, et al. Recurrent nodal metastases in the posterior triangle: Implications for treatment of the atypical tumour. Br J Oral Maxillofac Surg 2006;44:83-6. Simental AA Jr, Johnson JT, Myers EN. Cervical metastasis from squamous cell carcinoma of the maxillary alveolus and hard palate. Laryngoscope 2006;116:1682-4. Tao L, Lefèvre M, Ricci S, Saintigny P, Callard P, Périé S, et al. Detection of occult carcinomatous diffusion in lymph nodes from head and neck squamous cell carcinoma using real-time RT-PCR detection of cytokeratin 19 mRNA. Br J Cancer 2006;94:1164-9. El-Gohary YM, Metwally G, Saad RS, Robinson MJ, Mesko T, Poppiti RJ. Prognostic significance of intratumoral and peritumoral lymphatic density and blood vessel density in invasive breast carcinomas. Am J Clin Pathol 2008;129:578-86. Vazquez VD, Sachetto T, Perpetuon NM, Carvalho AL. Prognostic factor for lymph node metastasis from advanced squamous cell carcinoma. World J Surg Oncol 2008;6:73-8. Jin WL, Ye WM, Zheng JW, Zhou L, Zhu HG, Zhang ZY, et al. Occult cervical lymph node metastases in 100 consecutive patients with cN0 tongue cancer. Chin Med J (Engl) 2008;121:1871-4. Gershenwald JE, Andtbacka RH, Prieto VG, Johnson MM, Diwan AH, Lee JE, et al. Microscopic tumor burden in sentinel lymph nodes predicts synchronous nonsentinel lymph node involvement in patients with melanoma. J Clin Oncol 2008;26:4296-303. Uzquiano MC, Prieto VG, Nash JW, Ivan DS, Gong Y, Lazar AJ, et al. Metastatic basal cell carcinoma exhibits reduced actin expression. Mod Pathol 2008;21:540-3. Kruse AL, Grätz KW. Cervical metastases of squamous cell carcinoma of the maxilla: A retrospective study of 9 years. Head Neck Oncol 2009;1:28. D'Souza O, Hasan S, Chary G, Hoisala VR, Correa M. Cervical lymph node metastases in head and neck malignancy-A clinical/ultrasonographic/histopathological comparative study. Indian J Otolaryngol Head Neck Surg 2003;55:90-3. Kaur G, Carnelio S, Rao N, Rao L. Expression of E-cadherin in primary oral squamous cell carcinoma and metastatic lymph nodes: An immunohistochemical study. Indian J Dent Res 2009;20:71-6. Alam K, Khan A, Siddiqui F, Jain A, Haider N, Maheswari V. Fine needle aspiration cytology (FNAC), a handy tool for metastatic lymphadenopathy. Internet J Pathology 2010;10:25-32. Stokkel MP, ten Broek FW, van Rijk PP. The role of FDG PET in the clinical management of head and neck cancer. Oral Oncol 1998;34:466-71. Mukherji SK, Armao D, Joshi VM. Cervical nodal metastases in squamous cell carcinoma of the head and neck: What to expect. Head Neck 2001;23:995-1005. Park CY, Tseng D, Weissman IL. Cancer stem cell-directed therapies: Recent data from the laboratory and clinic. Mol Ther 2009;17:219-30.